Staple — елементарне (текстильне) волокно. Woven (fabric) — ткане виріб. Knitted (fabric) — в’язане, трикотажне виріб. Braided (fabric) — плетена тканину. Lace (fabric) — мереживна тканину. Felt (fabric) — нетканий матеріал, валяння виріб, повсть. Bonded fibre fabric — клеєне неткане полотно. chemical — produced from various substances by chemical processes (хімічні — вироблені з різних речовин за допомогою хімічних процесів). Removal of defects or foreign matter (видалення дефектів або бур’янів домішок). Removal of moisture (видалення вологості). Ability to withstand laundering or dry-cleaning (здатність витримувати прання або хімчистку). Reaction to heat and light (реакція на спеку і світло). Wash and wear (не вимагає прасування після прання). А тепер пропонуємо виконати наступні завдання. Read the information above. Mark the following statements T (true) or F (false). Give reasons. A textile is a fabric always made from fibres. All fibres are suitable for textile purposes. Filament is a fibre of continuous length. Staple is a fibre of limited length. Fibres can be spun into yarn or made into fabrics. 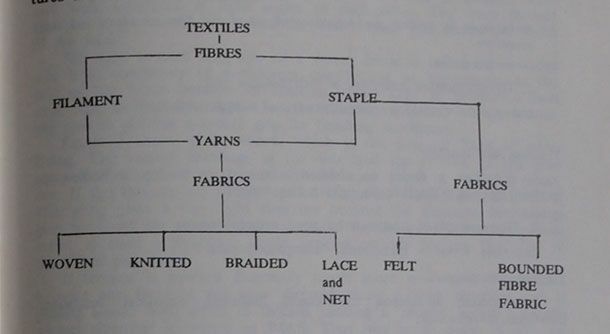 Classify the following fabrics into their fibre type — natural (N) or synthetic (S). Then choose from the box below which characteristics best describe each fabtic. a) Good insulator; luxurious, soft to the touch. b) Good strength, twice as strong as cotton; crisp to the touch. c) Lightweight; easy to wash; resists shrinkage and wrinkling. d) Luxurious; thinnest of all natural fibres. e) Soft to the touch; absorbent. f) Strong; resistant to most chemicals. Below are the instructions for how to look after your fabrics. Complete the texts using the words below. is easy to care for. It is (a) ______ and dry-cleanable and has good colour retention. is twice as strong as cotton and hand-washable or (b) ______. is (c) _____ or dry-cleanable, but has poor resistance to prolonged exposure to (d) ______. is easy to wash, resist (e) ______ and wrinkling, is fast (f) ______, but has poor resistance to continuous sunlight. is resistant to (g) ______; can be washed or dry-cleaned; is quick drying and wrinkle resistant; because of its low absorbency, (h) ______ removal can be a problem. It’s the fashion show season, and in parallel, Paris has been hosting the largest textile show in the world — «Premiere Vision». Seven hundred and forty-two exhibitors from thirty countries presented their offerings for the «Autumn — Winter 2007-2008» seasons. And this year some special guests — so-called intelligent fabrics — textiles, for example, that have built-in protection against staining. Intelligent fabrics — інтелектуальні тканини. Built-in protection against staining — «вбудована» захист від плям. If we imagine normal cloth being flat, with nanotechnologies the cloth takes a form a little like mountain. The structure’s invisible, of course, and dirt can not stick to a material like that. It runs off. So, here I’ll put a bit of ketchup on and I’ll take some water and there you see it’s a white cloth, and you can rinse off the dirt immediately. Dirt can not stick to a material — бруд не прилипає до матеріалу. To run off — стікати. Stain resistant materials, bacteria resistant materials, mosquito resistant materials, materials that can absorb smell or reduce perspiration. Materials that can measure your heart beat, or your breathing pattern. Textiles that are totally impermeable, textiles that are ultra absorbent, cosmetic textiles that moisten the skin, or apply perfume. Stain resistant material — старінню і забрудненню матеріал. Bacteria resistant material — антибактеріальний матеріал. Mosquito resistant materials — Антимоскітна матеріал. Absorb smell — поглинати запах. Reduce perspiration — скорочувати потіння. Moisten the ski n — зволожувати шкіру. The world of intelligent textiles is expanding and a multitude of European research centres are part of it. Here at Centexbel in Belgium, not far from Liege, scientists are dreaming of the next generation of intelligent or functional textiles. Prototype maker Martin Delgeder’s job is to transform these dreams into reality. Transform into reality — перетворити в реальність. Here we have a pullover that’s entirely knitted. The keyboard is supple. It enables the user to send a range of different commands. It was conceived for handicapped people, to allow them, for example, with a given code to open a garage door, to switch on the television. We’ve also got undergarments that allow you to monitor different body functions: breathing, heartbeat and so on using electrodes that are in direct contact with the body. We can also insert fibre optics into carpet. They are integrated in the production process to make the carpet luminous. They can be used for emergency exit, for example, if there’s a power-cut, or just to create putty patterns within the carpet. We’ve also used fibre optics in knitting. This creates the possibility of luminous knitwear. It can be used for outdoor safety clothing, or it can be stuck on walls and ceilings for decorative effects. Handicapped people — люди з обмеженими можливостями. Fibre optics — волоконна оптика. Power-cut — припинення подачі енергії. Luminous knitwear — світна трикотажний одяг. The most complex of these prototypes is probably the textile keyboard which can also function as a simple calculator. Jean Leonard has spent two years working on it. The key, and the interaction of materials that do and do not conduct electricity. In addition to the conventional materials, which are electrical insulators we’ve used metallic fibres that do conduct electricity. The principle is that when you do not apply pressure, there is no contact between two conducting layers. And when you apply pressure, you create a contact between the two layers. In addition to this, there’s a small micro electric component which has been miniaturized as much as possible, so that it disrupts the cloth as little as possible, because the goal is to preserve the characteristics of the textiles: suppleness and comfort. Suppleness and comfort — those are watchwords for functional and intelligent clothing. Yvette Rogister is in charge of the microbiology lab at the centre. She unlocks the secrets of textiles using this giant microscope. Her research helps to build an understanding how fibres react to the presence of certain nanoparticles. For example, cosmetic nanoparticles that release perfumes into clothes. Conventional materials — матеріал на основі класичних технологій. There are microcapsules which contain a perfume that’s integrated within the fibres that make up the cloth. What we’ve been looking at here, is how uniformly the microcapsules are spread across the cloth. And also we wanted to have an idea of ​​their dimensions. And then, after the material’s being used, we wanted to see how the microcapsules react, they are supposed to explode and release the perfume. And in fact, what we’ve seen here is that they are indeed microcapsules that have exploded and thus released their perfume. To release — випускати, звільняти. At the «Institut Francias du Textile et de l’habillement» outside Lyons intelligent textiles are tested for resistance against heat, flames, tearing, liquids. Engineers work on several Europe-wide projects and also invent their own textiles for the future. Once the concept has been established, the cloth is modeled to a chosen design; and added to a virtual collection of tomorrow’s fashion. The dreams to become a reality, you need a plasma machine like this. Here, in a vacuum, textiles are put in contact with different gases: oxygen, nitrogen, fluoride, or ammonia. In this way researcher Jack Makeone changes the textile properties. Fluorides, for example, make normally absorbent cotton impermeable, while nitrogen makes normally resistant materials absorbent. Nitrogen will separate off and try to impregnate itself in the textiles, so using nitrogen gas you can make a kind of water plasma which will attach itself to the surface. And when you put water next to this, there is a very strong affinity and that makes the material that absorbs very easily, which is good for cleaning materials or for absorbing sweat, or for sticky materials or for printable materials. On the other hand, fluoride gas makes cotton water-resistant, so when it rains, it’s impermeable, but still comfortable. Resistance against heat, flames, tearing, liquids — стійкість щодо спеки, вогню, зносу, рідини. To separate off — відокремлювати. To impregnate — насичувати, наповнювати. In these workshops a European programme to make threads of the future is being researched. Christophe Angelloz is developing polypropylene thread that resists high temperatures. The polypropylene is mixed with chemical microparticles whose composition is a commercial secret. The mixture is pummelled, melted, stretched and woven into yarn. It’s all polypropylene, but by changing the manufacturing conditions like the extrusion temperature, the weaving speed, the stretching tension you can optimize the thread production. Threads with like others made at the centre will now undergo testing to see if they might be useful in the creation of the new intelligent textiles of the future. Polypropylene thread — поліпропіленова нитка. To pummel — обробляти, трамбувати. Extrusion temperature — температура формувань штучного волокна.